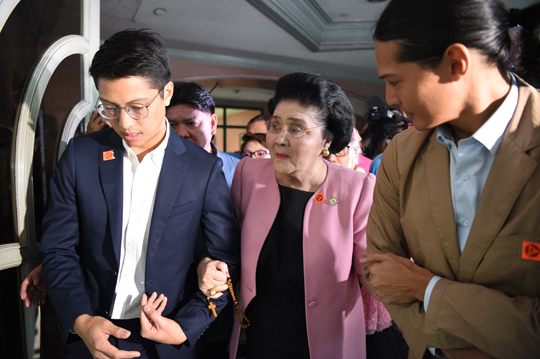 The Sandiganbayan Fifth Division on Friday allowed former First Lady and Ilocos Norte Rep. Imelda Marcos to post P150,000 bail for her temporary liberty. Marcos said she would have attended her last Nov. 9 promulgation before the anti-graft court despite being sick had she known the schedule. “If I knew about it your honor, I would have been here. Even if I was sick, I would have come here,” said Marcos, who said she learned about the promulgation of her charges from watching the news on TV. The bail is in effect until the Sandiganbayan decides on Mrs. Marcos’ motion for Leave of Court to Avail of Post Conviction Remedies, after she was convicted of seven counts of graft. “We will order her to post bond in the original bond. It’s about P150,000,” said Associate Justice Rafael Lagos, the chairman of the Sandiganbayan’s Fifth Division. Former Court of Appeals Associate Justice Manuel Lazaro, Marcos’ lawyer, responded to Lagos in the affirmative when asked about their readiness to settle the P150,000 bail. The P150,000 bail bond is the same amount that Marcos posted in 1991 that was forfeited following her failure to attend the Nov. 9 promulgation of her cases. The 89-year-old Marcos earlier apologized at the Sandiganbayan about her non-appearance last Nov. 9, citing health reasons. She also said her absence during the promulgation did not mean she disrespected the court. Marcos was accompanied by her children, Ilocos Norte Gov. Imee Marcos, former senator Ferdinand Marcos Jr., and Irene Marcos, as well as grandchildren Borgy and Mike Manotoc, and Luis Araneta, throughout the proceedings Friday. Senator Aquilino Pimentel III said Mrs. Marcos should be given a chance to explain her absence last week when the court promulgated her guilty verdict, saying this happens to thousands of accused. Marcos cited health reasons for her absence but managed to attend the birthday party of her daughter Imee.